Some people go fishing to relax, others make ships in bottles, and a select few create models of alternate-future energy weapons. If you've ever entertained the idea of spitting hot green globs of plasma at a troublesome rad-scorpion, or seeing off some pesky, brahmin-rustling raiders, then Ryan Palser's incredibly detailed Plasma Rifle model is probably the closest you're going to get without inventing a whole new field of weaponry. Palser - who is an animator by day - started building the model back in March and finished it earlier this month: a build time just a few weeks shy of five months. Palser wrote on his blog that he builds the models to relax, and has detailed all but the final step of the rifle's creation. It's constructed out of a combination of plastic, wood and metal, and contains electronic components to get that wonderful green glow. 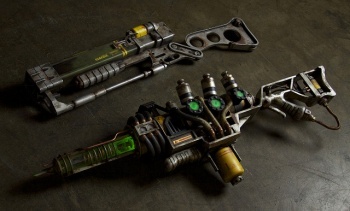 The plasma rifle isn't the first Fallout 3 weapon that Palser has created either; also pictured is the laser rifle he created earlier this year. According to Palser's Flickr page - where you can see a load of pictures of the both rifles - his next project is building a turret from Portal, and considering the amazing job he did on his last two projects, it's almost certainly going to look spectacular.